The quote below is from a woman living in Dunwoody as a response to an editorial in one of our local weekly free newspapers. 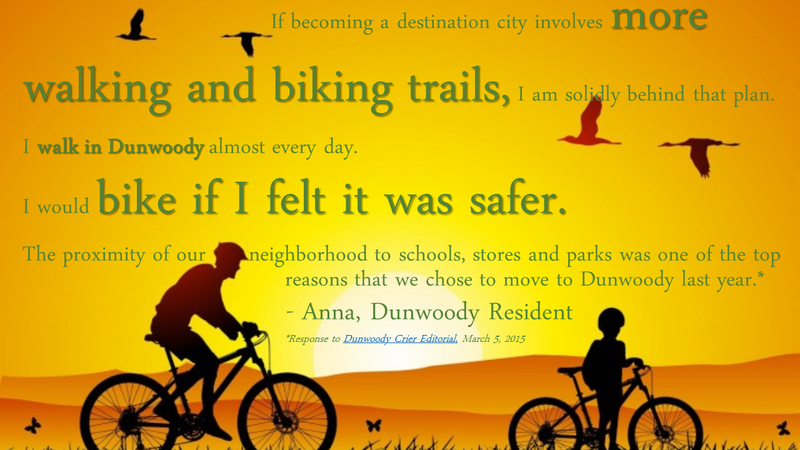 The Editorial basically said Dunwoody is not a destination city & the author hadn't seen any persons on bicycle or on foot on our new Dunwoody Village Parkway. This was at least the fifth editorial in this free publication since January from individuals opposing sidewalks, trails or bike lanes. Reading her response just made my day! If you appreciate streets that are safely designed for all people, please thank the Dunwoody Mayor & City Council and sign this on-line petition, posted at this LINK. Georgia Bikes: Vote for Bikes is a Vote for me!